The last time we checked in on the iconic "Gilmore Girls" gazebo, Rory had revealed to Lorelai that she was pregnant (By Logan? By a Wookie? By that other guy? We may never know.) in the final moments of the revival. 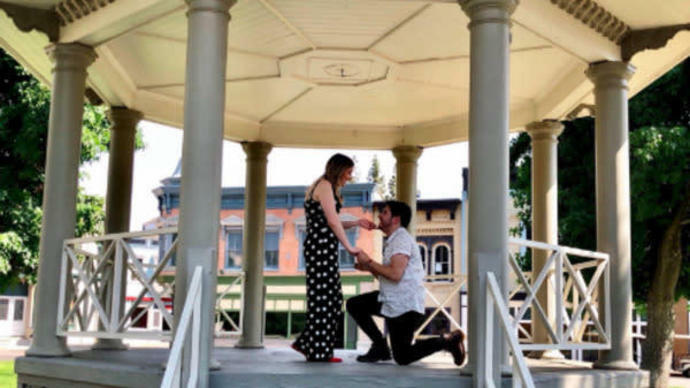 The Stars Hollow fixture has now played host to yet another lifetime moment, thanks to "Gilmore Girls" superfan Molly Larimer and new fiancé Sebastian. During a studio tour this month of the Warner Bros. lot where the beloved mother-daughter dramedy was filmed, Sebastian orchestrated a quick detour to pop the question. The proposal had apparently been in the works for months, with help from family and studio tour staff. "We got to the Stars Hollow area and our tour guide had everyone get out of the tram and go walk toward the gazebo," Larimer told Mashable. "We got up to it, and the guide asked us all if there were any big 'Gilmore Girls' fans in the group, and my fiancé and I both raised our hands." She said that's when the tour guide asked the couple to approach the gazebo, under the guise of doing an "improv scene." "When we got up onto the gazebo, Sebastian told me that we were there for another reason, and he got down on one knee," she continued. Thankfully, the moment was captured on video, which Larimer shared across social media. As for the continuing adventures of the onscreen "Gilmore" gang, a second season of the revival isn't looking terribly likely. "We haven't discussed it at all," Netflix's VP for original content, Cindy Holland, told reporters at the Television Critics Association summer press tour in July. "But [series creator Amy Sherman-Palladino] knows that we are very big fans of 'Gilmore Girls.'" Sherman-Palladino and husband and executive producer Daniel are currently at work on Amazon's critically acclaimed series "The Marvelous Mrs. Maisel," but have an out clause if they decide to make more episodes of "Gilmore Girls" for Netflix. "Gilmore Girls" star Lauren Graham, for one, previously admitted that she doesn't know "if there's a need to do more." "Now it's become what can we [still] do with this story that's satisfying, that [makes it] worth continuing, that will be gratifying to the people who care so much about it," Graham said at a Deadline panel in 2017. "I don't know if there's a need to do more. I would never want it to feel like we overstayed our welcome." However, Graham has since expressed an interest in returning for a one-off holiday-themed movie.